Help your fellow Brotherhood member regain their faith in the guild. Hildegard never returned to the Sanctuary after going out to pray for Tanek. Kor asked me to help him find her. Talk to Kor inside the Dark Brotherhood Sanctuary. Head to Anvil to inquire about Hildegard. Talk to the worshipers inside the Chapel of Dibella. 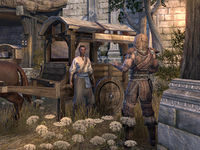 Convince the caravan master outside Anvil to share information about Hildegard's whereabouts. 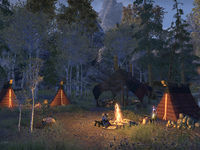 Travel to Jerall Mountains with Kor. Deal with the Silver Dawn enemies and track down Hildegard. Return to Anvil and speak to Kor and Hildegard. Return to the Sanctuary and inform Astara of the occurred events. "Ah, friend, am I glad to see you. It's Hildegard. She never came back after she went to say a prayer for Tanek. I think I could use your help." How long has Hildegard been missing? "After Tanek was injured during the Grand Sermonizer incident, Hilde went to pray for him and I haven't seen her since. No one has! It's not like Hilde to just disappear without saying a word to me or Astara." Where does Hildegard usually go to pray? "She loves temples, but the trouble in Kvatch has made her avoid the big Cathedral. Lately she's been visiting the Great Chapel of Dibella in Anvil. I think the rituals soothe her. Will you come to Anvil and help me find Hildegard?" I'll help you find Hildegard. "I'll meet you at the Chapel in Anvil. Hopefully, we'll find Hilde curled up and sleeping under Dibella's statue. Just be careful when you get to the city. The Pirate Queen hates the Brotherhood almost as much as the Sermonizers do." Head to the Great Chapel of Dibella at Anvil. There, Kor will give you an update: "Hilde's not here. Let's ask around and see if any of the worshippers have seen her." Speak to Garrebh, Decalus Carius, and Bellucia Leraud; each will tell you that they haven't seen Hildegard, or at least can't remember seeing her. "Your interest in this young Nord woman has certainly piqued my curiosity. Tell me who she is and I'll tell you what I saw." She's a friend who's gone missing. I'm trying to find her. "I saw a young Nord with a flower in her hair talking to Chanter Nemus, over by the Akatosh shrine. I remember it because it was so odd. He was whispering in her ear and standing much too close for a man who wasn't her father or her lover." Could you hear what he was saying? "Oh, believe me, I tried! When they were finished, the poor young woman had tears streaming down her face. She ran out of the Chapel as the Chanter looked on. He had a self-satisfied smile on his face. Do you think he said something ... improper?" I'm sure it wasn't that kind of discussion. "No, no, of course not. A man as pious as Chanter Nemus would never do anything untoward with a young Nord woman. I mean, even the rumor of such an event would be scandalous. Don't worry, though. I won't say a word about your friend and the Chanter." I wouldn't put it past one of the Chanters to take advantage of their position. "I knew that Chanter was up to no good! 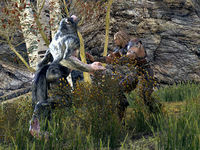 Sneaking around, meeting with mysterious young Nords with flower in their hair. It's simply scandalous! Don't worry, though. I'll leave your friend out of this when I tell my story at the tavern tonight." "Troll's blood, can these people gossip! They're worse than the Rat Master's informants, and he pays them to dredge up secrets! Hilde was here, but no one could say where she went or when. Tell me you had better luck, Initiate." A woman saw Hildegard speaking with Chanter Nemus before she fled in tears. "A Chanter spoke with Hilde? That's not what I wanted to hear! Understand, Hilde isn't like us. She grew up in the wild. The idea of being civilized is really new to her. And she still feels guilty about the wolf that's inside her." You think the Chanter said something to upset her? "It certainly sounds that way to me. It doesn't take much to turn her guilt about what she's done as a wolf into self-loathing. I'm constantly trying to get her to change her feelings on the matter, but her beliefs run deep." Any idea where she'd go in such a state of mind? "Back to where it all began. Back to Skyrim. I'll check at the docks to see if she tried to secure passage on a ship. You go talk to the caravan master. Hopefully one of us will discover which route she took to go back to where the wolf was born." I'll talk to the caravan master. "The next caravan will be ready to leave shortly. If that interests you, find a place nearby to sit for a spell and I'll call you when we're ready." I'm looking for a young Nord woman. Wears a flower in her hair. "Well, isn't that interesting. You're the second menacing stranger that's asked me about a Nord who may or may not have fled in tears. Even if I had seen this young woman, why do you think I'd tell you anything?" I'm trying to help her. Her family is worried about her. "Right. Her family. The way that young woman was crying, you'd think Molag Bal himself was after her. Or someone like you. 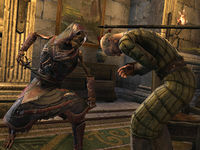 If I had helped the Nord—and I'm not saying I did—you'd have to do a lot better than that to get me to tell you anything." How can I convince you I'm trying to help her? Did your caravan take you to Skyrim? Bilami: "Sorry. I protect my customers and their secrets. I have nothing else to say to you." Kor: "Caravan master, please! The young woman with the flower in her hair — she's in terrible danger!" Bilami: "Well, look at you! You must be the brother." Kor: "So you did see Hildegard. Please, you need to tell us where she's gotten to." Bilami: "You're all she talked about other than begging me for transport. She said she was gonna miss you most of all." Kor: "Word on the docks was that the Silver Dawn was looking for my sister too. We need to know where she went." Bilami: "The young woman wanted a ride to the Jerall Mountains. Sent her on the last wagon, but I can take you there if that would help." Kor: "We'd appreciate that. Thank you." "The news about the Silver Dawn has made me even more concerned about Hilde's safety. We have to hurry!" What was that about the Silver Dawn? "The Silver Dawn are werewolf hunters! Whatever that Chanter said to Hilde has made her run back to the wilderness where I found her, and now a hunting party is on her trail. They're going to kill her, Initiate!" Not if we reach her first. "Sorry I gave you the run-around, but I was just trying to protect my passenger. Those Silver Dawn ruffians came around asking about her right before you did. I didn't say a word to them, either. Just let me know when you're ready to go to Skyrim." "Then hop aboard the wagon and let's get going. I'll get you there as fast as I can without throwing a wheel. Well, at least without throwing more than one. If the Silver Dawn hunts your friend, you better be ready for a fight." I'm always ready for a fight. While following her trail, you'll locate a Silver Dawn camp, visible on your map as a collection of small structures arranged vaguely in a circle. You'll need to kill enough Silver Dawn personnel at the campsite to draw out Purifier Gunthafur, and then strike him down as well. Once you do, a half-dressed Silver Dawn hunter, Acolyte Cirges, will emerge from one of the tents and say, "Spare me and I'll tell you where the werewolf is. We tracked her to the south!" He'll flee, leaving you to continue looking for Hildegard. While you're at the campsite, you may as well inspect it until you find their contract, so you can learn who their client is. Kor: "It's me, Hilde, your big brother! Calm down. We're here to help." Kor: "Remember yourself. Remember who you are." Kor: "That's good, little sister. Very good. Breathe. Relax." "I did not mean to cause so much trouble. I never meant to put you or Kor in harm's way." Why didn't you return to the Sanctuary, Hildegard? "I meant to. But the Chanter told me I had to flee. He said my past and my wild nature were going to cause the people I love to come to harm. He said the deaths of our Brothers and Sisters were my fault—and it was going to get worse if I remained." Chanter Nemus told you all this? He knows about you and the Brotherhood? "The Chanter sings to the Divines. He speaks for Akatosh! I had to tell him things. About me. About the family. It happened before. I was a danger to my wolf clan. Now I am a danger to Kor. To you and the others. You're all better off without me." Chanter Nemus deceived you. He sent the Silver Dawn to kill you. "No! Why would the Chanter do that? He told me to return to my old life, to the wilderness. He said I'd be safe, that no one else would get hurt if I left. He promised that Akatosh would show me the way!" We're a family, Hilde. We protect each other. We're stronger together. "You... you really mean that? Even after I abandoned the family, you still want me around? I'm sorry I caused so much trouble. I let my fear allow the Chanter to deceive me. That is not going to happen again. Kor and I, we'll handle things. Together. Let's get back to the Gold Coast. You abandoned us when we needed you the most. It was foolish and dangerous. "I ... I—you're right. I should never have listened to the Chanter. But after what happened to Tanek, I let my fear of losing my family drive me to do something stupid. I should have come back and talked to Kor. I—I'm sorry. I'm ... I'm so sorry." I think we should get back to the Gold Coast. "I appreciate your help, but I think you were too hard on Hilde. She knows she was tricked by that religious fool. She won't let it happen again." You need to make sure Hildegard gets to the sanctuary safely. "I know. And I will. I'm just not eager to see Astara. She won't be pleased when she hears about this. I wish I knew what Chanter Nemus hoped to accomplish. Someone needs to stick a fork in him and call him done. Anyway, we'll see you back home." "I won't run off again. I promise. My place is with my family. No matter what happens. Still, I hate that the Chanter tricked me. I'm going to follow Kor's suggestion and stick a fork in the old fool. Or in this case, a very sharp knife." I'll handle the Chanter. Where can I find him? "You'd do that? For me? I ... thank you. Chanter Nemus tends to the Akatosh shrine in the Chapel of Dibella. He spends a lot of time in the chapel office when he isn't lying to foolish young women. Make him feel pain before you kill him, all right?" I'll take care of the Chanter. Go home, Hildegard. With that, enter the Chapel of Dibella, go downstairs, and enter the chapel office (where you will be considered trespassing). Chanter Nemus is the only person inside. If you have Shadow Cloak or an invisibility potion, then killing him is as simple as sneaking up and using the Blade of Woe; otherwise, you'll have to fight. Either way, once the deed is done, you can search around for his Letter to the Grand Chanter if you're curious about his motives. "I understand we have you to thank for Hildegard's safe return. Are you going to tell me what happened or do I have to torture Kor until he sings?" Chanter Nemus tricked Hildegard and I killed him for it. It won't happen again. "I hope you're right. But why do the Akatosh priests seem to be moving against us? First the Sermonizers, now this. Are they trying to take advantage of our recent setbacks or is there something more going on here? I should find Kor in the Sanctuary as soon as I can. Kor suggested we start our search at Anvil's Great Chapel of Dibella. Hildegard often goes there to pray and contemplate the Divines. Kor suggested we talk to the worshipers to find out if any of them saw Hildegard in the chapel recently. I found out that a woman saw Hildegard talking to Chanter Nemus near the Akatosh shrine. I should let Kor know and ask him if he discovered anything that can help us locate Hildegard. A very worried Kor thinks that Hildegard may have gone back to where he first found her—the wilderness of Skyrim. While he checks at the docks, he wants me to talk to the caravan master to see if she arranged travel there. I think the caravan master helped Hildegard leave Anvil, but I can't get a straight answer out of her. Maybe Kor can convince her to help us. I should stand back and let him give it a try. Hildegard told the caravan master about Kor, and she recognized him. She's agreed to take us to the Jerall Mountains in Skyrim, where she took Hildegard. I should talk to her when we're ready to go. We arrived in the Jerall Mountains of Skyrim. Now we need to track Hildegard and find her before the Silver Dawn hunters kill her. I tracked Hildegard to a camp that's overrun with Silver Dawn hunters. I should deal with these hunters before I continue to search for Hildegard. The Silver Dawn has apparently been tracking Hildegard, too. They reached this spot and set up a camp. A surviving member of their hunting party suggested that her trail continues to the south. I should hurry and find Hildegard. I watched as Kor calmed Hildegard and got her to change back into human form. I should talk to her and find out what this was all about. Hildegard was tricked by Chanter Nemus and then set upon by the Silver Dawn. It was all some sort of elaborate trap, but we don't know what motivated the chanter. I need to either offer Hilde words of encouragement or scold her to teach her a lesson. I let Hildegard know what I think of her actions. It's time for us to return to Anvil. I should talk to Kor and make sure he gets Hildegard safely back to the Sanctuary. I should talk to Hildegard to find out what I can about Chanter Nemus. Chanter Nemus has an office beneath the Chapel of Dibella in Anvil. I should travel there and deal with him for trying to deceive the Dark Brotherhood. I should return to the Sanctuary and let Astara know what happened. Finishes quest Hildegard was tricked by Chanter Nemus for some unknown reason, but Kor and I were able to keep her safe. I should let Astara know what happened. This page was last modified on 9 July 2018, at 16:08.